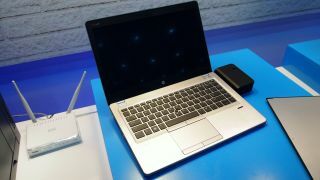 This is HP's new Ultrabook for business – a "no compromise" business laptop according to the company. Sadly though, we won't be seeing it any time soon – the 14-inch HP EliteBook Folio 9470m release date is October. You might also wonder why this particular machine isn't on. And you'd be right to winder; this is just a prototype of the new device, which doesn't switch on, while the keyboard is solid. As well as a stylish MacBook Pro-alike chassis which is 19mm thick, the trackpad is humongous as you can see, while there are dual mouse buttons for easy access when typing. The EliteBook Folio will also feature a TPM (Trusted Platform Module) chip for encryption so corporates can manage it as part of their wider IT infrastructure. It will also no doubt feature Intel's forthcoming next-generation Core processors as well as Beats Audio. For a 14-inch unit, the cited 1.58Kg isn't too cumbersome, but it isn't as lightweight as many existing Ultrabooks such as the 1.1Kg Toshiba Z830 and 1.4kg Dell XPS 13 (the latter device also has a TPM). Connectivity is plentiful, with three USBs, Ethernet, VGA and DisplayPort - as this is a business laptop there's no HDMI. Here's the docking station and extra battery slab in action. There are plenty more USB ports on the docking station.